Soundscapes Real and Imagined from the San Francisco Bay Area – A two-hour mix of soundscape recordings and compositions native to the San Francisco Bay Area. Orignally broadcast February 22, 2009 on free103point9.org, an episode of Giant Ear, the radio voice of the New York Society for Acoustic Ecology. 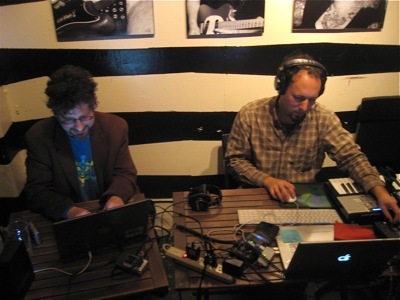 Last August, Jonny Farrow, Ned Mooney and Andrea Polli of our New York-based sister organization New York Society for Acoustic Ecology (NYSAE)  were visiting San Francisco. We had a meet up and mind-meld, out of which came an idea: Could BASE produce a two-hour show for Giant Ear))), NYSAE’s monthly radio program on free103point9.org ? The theme of our show was very clear from the start: we would focus on the sounds of the place where we live, the greater San Francisco Bay Area. We live in an area full of clear soundmarks and vast contrasts juxtaposed. The Bay shores of Alcatraz Island, the swells of the Pacific on Ocean Beach, the wharves and marinas; the grit and tourist-charm of Chinatown, the ice cream carts and taquerias of the Mission, the sound exhibits of the Exploratorium, the windmill fields of Livermore and Pleasanton. Group social sounds of public ceremony, celebration, protest and everyday life. And closer times like a Mah-Jong game, a family dinner, and the last notes of a funeral dirge. The sounds of getting around, footsteps, subways, cable cars and of course – like everywhere – trucks, cars and planes. To realize this idea, we called on members of our community to send us their sounds. And we scoured our own libraries for favorite material. About 45 minutes of our show (from 0:03:34 to 0:53:23) was performed by Jeremiah Moore and Aaron Ximm live on-the-air on Pirate Cat Radio . Thanks to DJ Yuri G for having us on – check out his show Psionic Dehiscence. In keeping with the “Imagined” part of our concept, in several places we played composed works in their entirety. At 1:18:38 “Sweeper” by Jeremiah Moore, at 1:35:24 “Maritime Suite: Port” and at 1:46:37 “Maritime Suite: Starboard” both by Aaron Ximm. And so, it’s with great pleasure that I present our program. David Silberberg [d4doc.com] -Berkeley Traffic, UC Berkeley Campus ambience, Cordonices Creek Berkeley CA. On May 14th sound designer James LeBrecht presented a selection of favorite sounds he has recorded over the years with a focus on his recent installation for the Oakland Museum exhibit TRADING TRADITIONS: CALIFORNIA’S NEW CULTURES (January 19-April 6, 2008) as well as other recordings both urban and natural. Award-winning sound designer James LeBrecht has supervised or edited sound for feature films and documentary project that include The Blood of Yingzhou District, Daughter from Danang, Battlefield Earth and The Skulls. In the exhibition world, James has designed sound for the E3 conventions in Los Angeles, the Rock and Roll Hall of Fame and the Luxor Hotel in Las Vegas. Game credits include work for clients such as EA, MAXIS, TECMO and Midway Studios-Austin. James has designed and produced sound effects and music for over 100 professional theatrical productions and co-authored the book “Sound and Music for the Theatre: The Art and Technique of Design” with Deena Kaye. For Basebot, James started with some selections from TRADING TRADITIONS “which vividly depicts how immigrants to the Bay Area don’t just want to fit in, but to remain distinct within the community at large and among other newcomers.” He did the sound design for the exhibit and recorded much of the material that was used. We all listened as he skipped around through the various different clips that he had. One was a round being sung in a church. There was a clip of a multicultural dinner with at least 3 different languages being spoken at various times which was fun to hear. Also interesting was hearing all the different sounds from the dinner table and kitchen as well as a piano being played in the background. He then played a different take on Gershwin’s Rhapsody In Blue with ethnic instruments from mostly eastern cultures as the orchestra, which was a highlight for me. James also had some great foghorn recordings that he sampled for us. Some other recordings were of some street scenes late at night in the tenderloin. There was some discussion of technique and equipment. James had purchased a Zoom recorder which led to some talk of the benefits and disadvantages of the Zoom and how it works. We listened to some urban soundscapes he’d recorded in quadrophonic, and discussed the differences between recording in quad and stereo. Someone asked about mixing down from quad to stereo and James talked a bit about his work in film and dealing with this aspect of recording. Dan Dugan remarked on the disappearance of various urban sounds that you don’t hear nowadays such as the Filmore District of the 1960s – more people on the streets in certain neighborhoods before more cars were routed through those streets. Toward the end of the evening James played some old recordings he did in his mother’s backyard in Maryland. These were summer recordings with evening insect and frog sounds. There was also a thunderstorm clip too that was fantastic. James talked a bit on using PZM mics for certain location recordings, which led to some talk on frequency issues with certain mics. This then led to another discussion of what were people’s favorite sounds. For some, childhood sounds were favorites while others had more specific personal choices. All in all it was a fun evening with interesting sounds and conversation. Natural sound recordist and sound designer Andrew Roth presents material from his as-yet unreleased work Natural Sounds of Japan. He shares stories behind the recordings, and discusses technique. Last night saw the second iteration of the BASEbot listening salon, featuring sound recordist and designer Andrew Roth, at Dan Dugan Sound Design in San Francisco. We had a small but wonderfully diverse group – and many good conversations were had. For more than a decade Andrew Roth has been an active member of The Bay Area sound community. After graduating from Oberlin College in 1995, he took up residence at San Francisco’s Earwax Productions, working on both popular commercial and smaller independent projects ranging from radio to theme parks, television, film, games, and everything in between. In 2001 Andrew founded Natural Sounds, with the dual purpose of continuing his growing post-production business as well as promoting a growing catalogue of natural sound recordings captured during his travels. The first of these, Natural Sounds of Costa Rica (now in its 7th printing) provides a sampling of the myriad soundscapes of that Central American country. After much delay, he will soon be releasing its follow-up, Natural Sounds of Japan. This new collection covers an even greater variety of aural terrain, tying in the rich cultural and historic fabric of the country, and recorded across the entire archipelago throughout its many distinctive seasons. The goal of all these recordings have been to create as complete a transportive and immersive listening experience as possible. Andrew shared sounds from his work-in-progress Natural Sounds of Japan. The first recording was a rich array of animals from a subtropical island between Japan and Okinawa. A dove’s flutey sound, a melody reminiscent of certain strains in Gagaku, the court music of imperial Japan. Then microphones inside a pipe found jutting out of the ice in the far northern winter capture an unearthly desolate cold beauty. Ice sheets on a frozen-over beach creak like old doors. A bamboo forest, several days dry from rain, emits pointed resonant pops pinks and cracks. It begins to rain and thunder as an enormous boar appears… And then, taking us to Costa Rica, we hear the breathing of an active volcano. We talked technique a bit. Andrew’s finished soundscapes are constructed of layers from wide-spaced omni ambience recordings and mono spot-recordings of individual species. His mixes can be kaleidoscopic at times – wide and full – always something interesting happening. The idea being to build a translation of the original natural-context listening experience into the medium of recordings-heard-on-speakers. Personally, I was impressed with the beauty of a wide-spaced omni stereo array in capturing the sense of space you experience in the woods – particularly the way a breath of wind moves among trees. Aaron and I recorded the evening. It’s available on the BASEbot podcast. 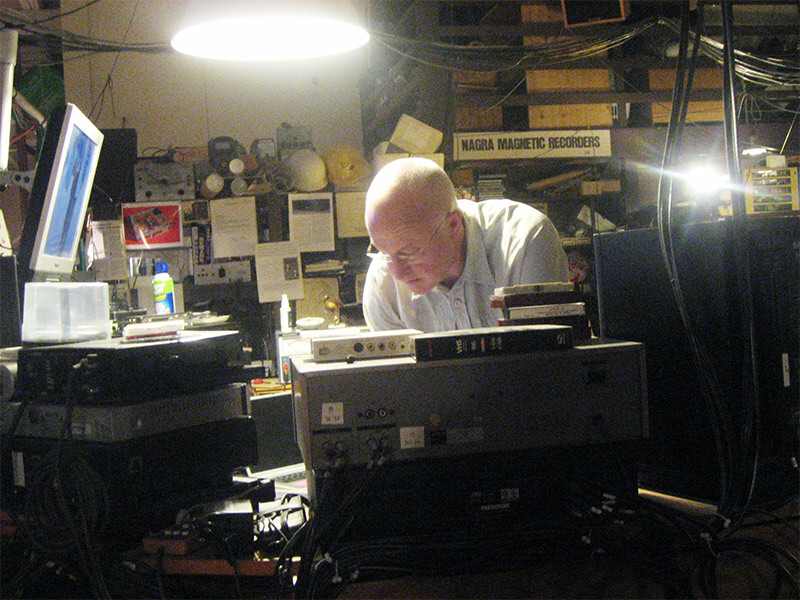 An hour-long lecture in two parts from field recordist Chris Watson. Part One defines a personal ontology for recordings, dividing sounds into (sometimes metaphorical) ‘atmospheres,’ ‘habitats,’ and ‘featured species,’ and describes several favorite techniques Chris has used to make those different kinds of recordings. Part Two features an in-depth account of recent work with four-channel surround sound hydrophone recording, both in the open water and buried in shallow sand or mud. Both sections are richly illustrated with favorite old and new and unreleased recordings, in both stereo and four-channel surround. (The presentation was recorded in Stereo, via a single point stereo mic in the room. 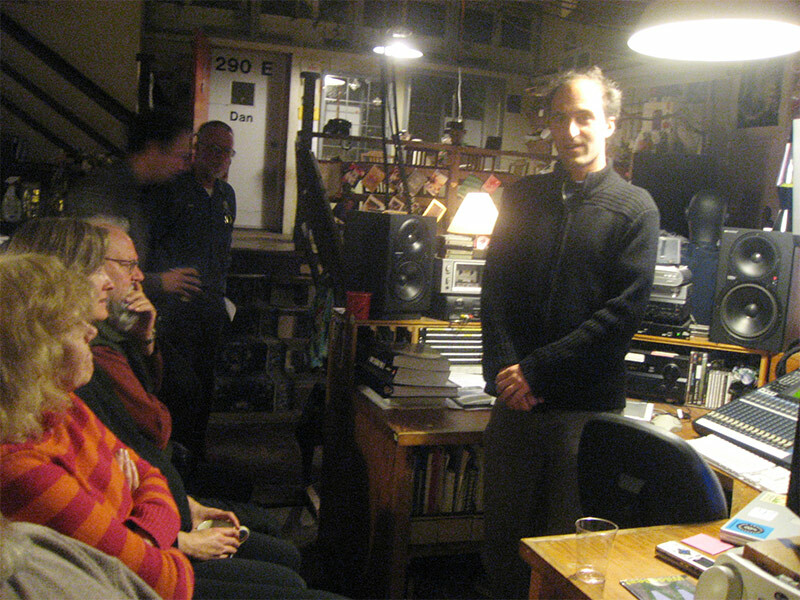 Our nascent Bay Area chapter of ASAE, Bay Area Sound Ecology, held its first public listening salon on November 28. Christened ‘BASEbot’ with a nod to the popular Dorkbot model of informal technical salons, the event was intended to introduce both the chapter and the salon format to potential members. BASEbot is an experiment in bringing people together around listening and the soundscape. It is envisioned as a meeting place for ear-minded people, and ultimately a platform for soundscape oriented projects. Toward that end I think our first salon was a great success! We had about 40 people attend to hear Chris Watson’s excellent presentation of sounds and techniques. 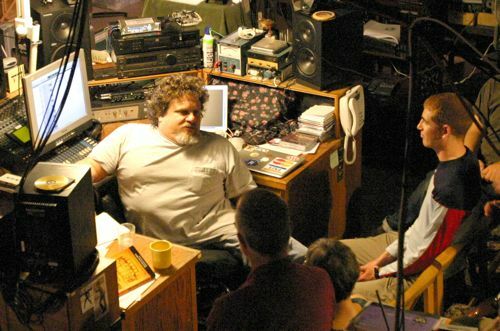 The meeting was launched by host Dan Dugan, well known as inventor of the Dugan Automatic Microphone Mixer and for his work with the Nature Sounds Society. Dan described his personal history and introduced the space for our meeting: his comfortable surround-sound equipped studio and home. BASE co-chair pro tem Jeremiah Moore then introduced BASE and outlined the goals of the organization: to be a broadly-inclusive multidisciplinary forum for all Bay Area residents interested in listening and the soundscape. Jeremiah also described the (roughly bimonthly) BASEbot forum, which we envision will consist of one or two featured speakers, a time for announcements and calls for discussion, a break for informal discussion, and finally a sign-up listening salon, for sharing recordings and other soundwork with a like-minded and supportive (or if desired, critical) audience. Finally, Aaron Ximm (other BASE co-chair pro tem) briefly introduced the night’s featured speaker, Chris Watson, one of the best-known field recordists in the world. Chris delivered an hour-long lecture in two parts. Part One defined a personal ontology for recordings, dividing sounds into (sometimes metaphorical) ‘atmospheres,’ ‘habitats,’ and ‘featured species,’ and described several favorite techniques Chris has used to make those different kinds of recordings. Part Two featured an in-depth account of recent work with four-channel surround sound hydrophone recording, both in the open water and buried in shallow sand or mud. Both sections were richly illustrated with favorite old and new and unreleased recordings, in both stereo and four-channel surround. Chris’ presentation was recorded via a stereo microphone in the room; the hour-long two-part lecture now available via the BASEbot Podcast. BASE is currently forming as an organization, and we invite any interested persons to join us. We anticipate meeting next in February 2008. 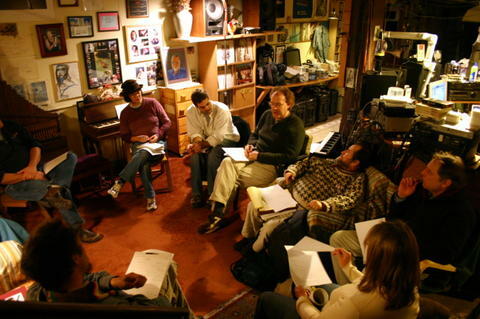 We hope to draw members from the broadest group – be they sound designers, radio producers, composers, musicians, bioacousticians, or simply humans who listen. Welcome to the BASE news site / blog and podcast. Though I’m setting this up in may 2008, we’ll engage in a bit of revisionist history, back-dating the posts for BASEbot 1 and 2 to the dates of the events. (And back dating this post so it appears first!) How’s that for subterfuge. I’m personally pleased to present these recordings, and am looking forward to more in the months to come.